A lobster roll is a kind of sandwich filled with lobster meat. A traditional lobster roll contains the fresh cooked meat of a lobster, tossed with mayonnaise and served on a grilled hot dog bun or similar roll, served so that the opening is on the top rather than on the side. The filling may also contain diced celery and/or scallion, or may use drawn butter instead of or in addition to mayonnaise. The sandwich can also contain lettuce, lemon juice, salt and black pepper. Traditional New England restaurants serve lobster rolls with potato chips or french fries on the side. Lobster rolls in the U.S. are especially associated with the state of Maine, but are also commonly available at seafood restaurants in the other New England states and on Eastern Long Island in the U.S., where lobster fishing is common. They are a staple summer meal throughout the Maritime provinces in Canada, particularly Nova Scotia where they may also appear on hamburger buns, baguettes, or other types of bread rolls — even pita pockets. The traditional sides are potato chips and dill pickles. 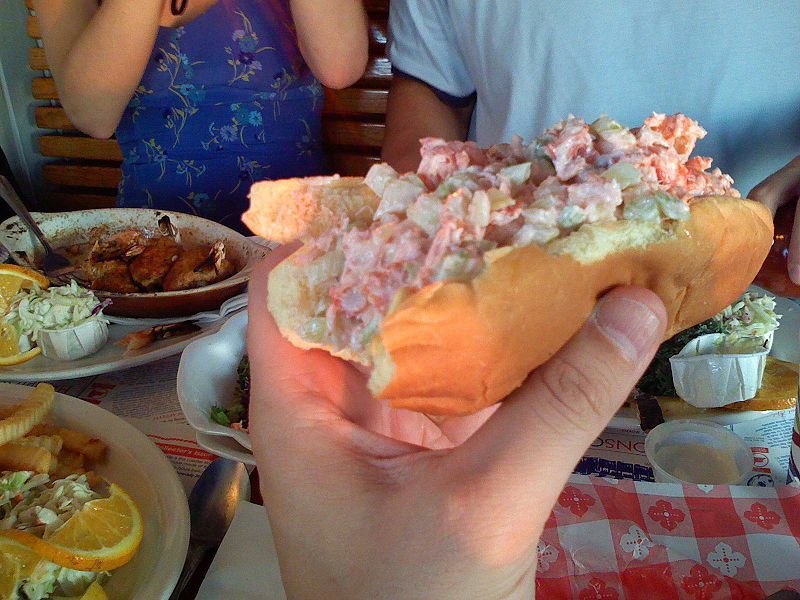 There is also a variant called the Connecticut Lobster Roll, which is warm lobster, fresh from the shell with drawn butter.